Rare. Exquisite. Beautiful. 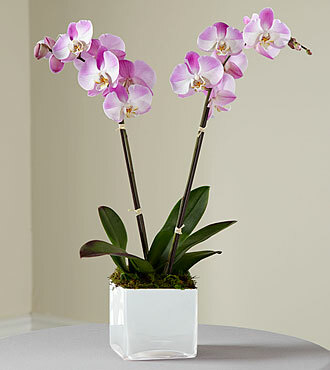 This exotic orchid plant makes a loving way to honor a very special someone who has passed away. The graceful, double stemmed Pink Phalaenopsis Orchid is elegantly planted in a simple white glass cube planter by an FTD artisan florist. It says so much about the life you are celebrating and your superb taste. It makes a lovely addition to a wake and a long lasting gift that delivers your condolences to grieving family and friends at home to let them know they remain in your thoughts. "My life is so busy that having the choices you offer is a god-send. The prices are within a budget that most anyone can afford. Thank you for making it easy. Same day delivery was the best bonus!" -- Karen F.